‘Chasing’ Carly writes about how a distribution went rather wrong, under the title Crowd Control. So how should you organise a distribution? Make sure that the recipients know in advance when and how the distribution will be organised. In Carly’s case, probably the right time to do so would have been when the coupons were handed out, the day before. Make sure that the goods are there when promised, and make sure you have enough. Nothing will incite a riot as handily as handing out goodies to the first half of the crowd and then tell the other half they will have to go back home empty-handed. Make sure your distribution area is well prepared. As Carly observes, nobody likes to stand in the sun (or rain, or driving wind) for long periods of time, so make sure there are shelters; use rope and posts to demarcate corridors for lines; prepare signs for the various queues; make sure that you have communication equipment (a.k.a. 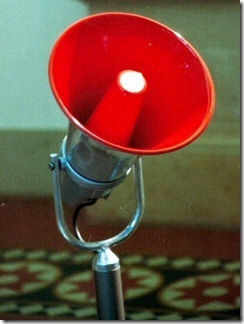 a megaphone or bullroarer); ensure water, sanitation, and where appropriate, food are available; etcetera, etcetera. If you start thinking about this on the day itself, you are definitely too late. Make sure that your registration system is prepared. I will write more about this at some time in the future (thank you, Rob Stephenson, for giving me some serious food for thought on the subject). Make sure that you have crowd control systems in place. Have ‘crowd controllers’ in situ several hours before the distribution starts. Ensure that they are clearly recognisable. Have authority figures from the community (elders, church leaders, whatever works in the context you are in) assist them by bolstering their clout and by defusing possible conflicts. Make sure that everybody knows what to do when things get really ugly (basically: run). Make sure that you have logistics back-up capacity. Have one or more people with some logistics experience at the ready who are not directly involved in the distribution itself, and who can jump in when logistics (for whatever reason) breaks down. Ensure that they have sufficient extra materials (rope, plastic sheeting, water, duct tape, spare megaphone, etcetera, etcetera) to be effective. And a bonus step: don’t call in the cavalry unless lives are in danger. In most aid contexts, it is a sure-fire way to lose cooperation. The ever-interesting Chris Blattman published a list of things to bring for field work. A very useful list, I should add, and some of the suggestions in the comments are very worthwhile too. Just don’t try to bring everything that’s in there. So what specifics would I add for a logistics deployment? A clicker (one of those thumb model counters). Will help you immensely during verification activities. Cling wrap. Has more uses than I can easily mention here, but for starters: repairing leaky containers, repairing car windows… actually, combined with some duct tape, it can repair almost anything — even, in an extreme situation, some bodily harm (but get to a doctor ASAP). So the next one, obviously, is duct tape. More uses than you or I can even imagine. Sticky labels, A6 size (4 on an A4 page), printable. Again, more uses than you would expect. Permanent markers. You will always see that you need them when there are none around. An el-cheapo digital camera, preferably one that can make rudimentary videos. Worth its weight in gold for training purposes. The electronic version of the ordering catalogue of whichever organisation you are working for. Your organisation is too small to have a catalogue? Get one from a bigger organisation with similar activities (so in the medical area the MSF catalogues, for education UNICEF, for water and sanitation OXFAM, etcetera). This will help you immensely when ordering yourself or when getting people to be more specific on their orders. Your organisation’s logistics, admin, and financial procedures in electronic form, including the standard forms used. So what do you take with you when you go to the field? Actually, your organisation is not too small. If it is big enough to have more than one programme, it is big enough to have a (rudimentary) catalogue.